Vishy Anand missed a beautiful cheapo that allowed David Navara to escape alive from a game where he looked doomed both on the board and on the clock. 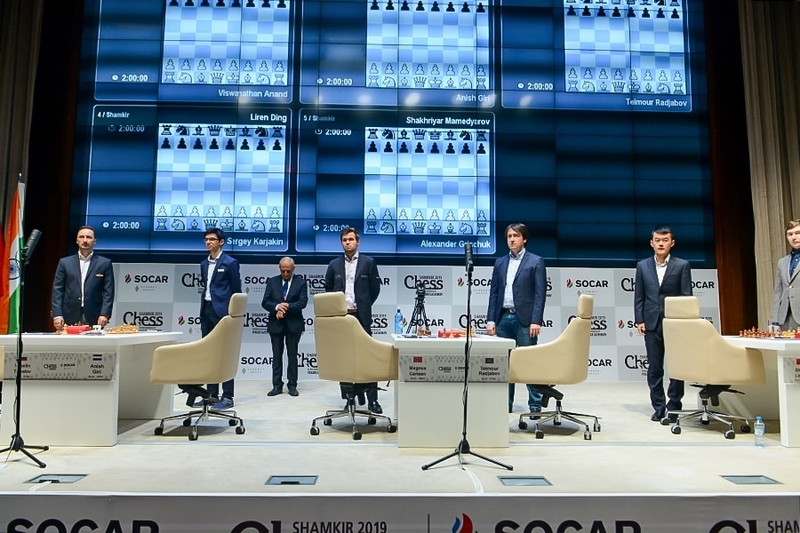 All five games of the first round of the 2019 Gashimov Memorial in Shamkir were eventually drawn, though not without a fight. 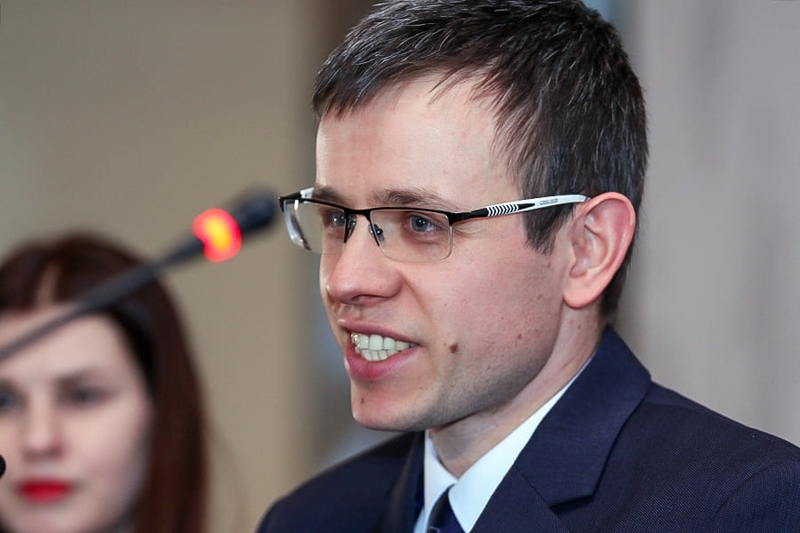 World Champion Magnus Carlsen was in serious danger against Teimour Radjabov, while both players spent time living dangerously in Giri-Topalov. 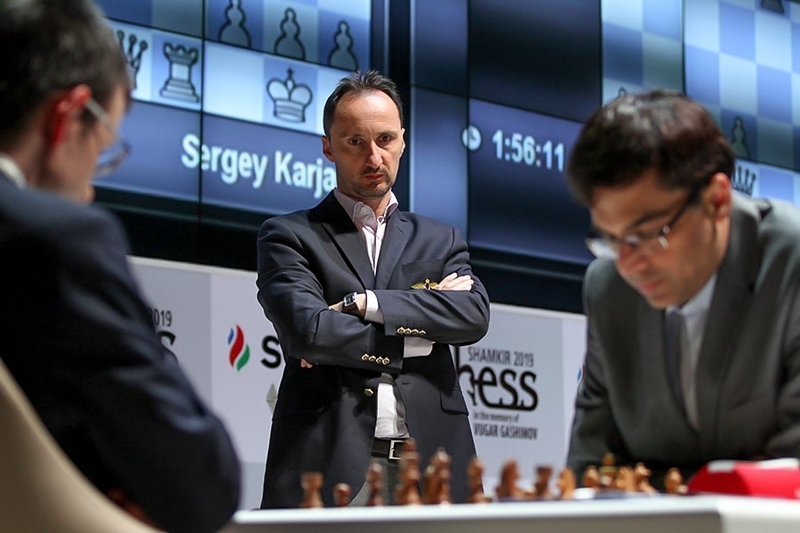 Karjakin-Ding Liren was sharp but brief, while only Grischuk-Mamedyarov was instantly forgettable. 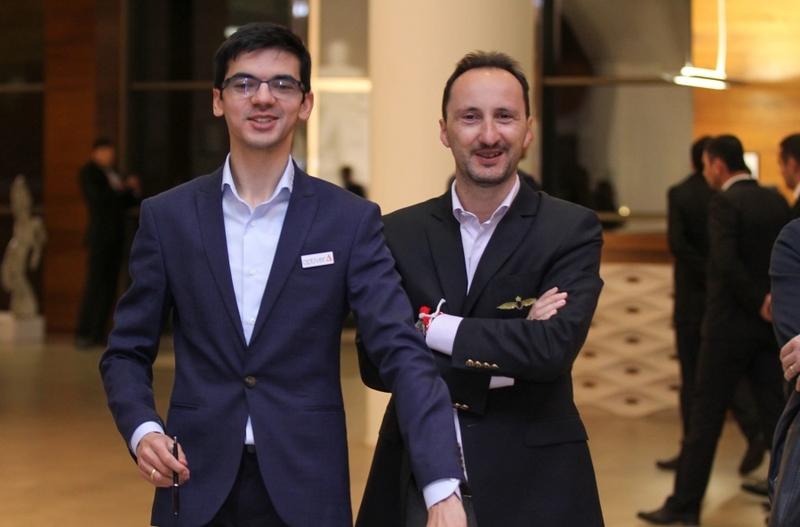 It’s just over five years since the immensely talented and much-loved Azerbaijan Grandmaster Vugar Gashimov passed away, and this is already the 6th tournament held in his honour. 20…Qg7!, preventing Bg4 from White, was the move, but perhaps “find” is inappropriate, since the world no. 3 barely paused for a moment during the game. It ended in a repetition with 21.Bh6 Qf6 22.Bf4 Qg7 23.Bh6 and so on. 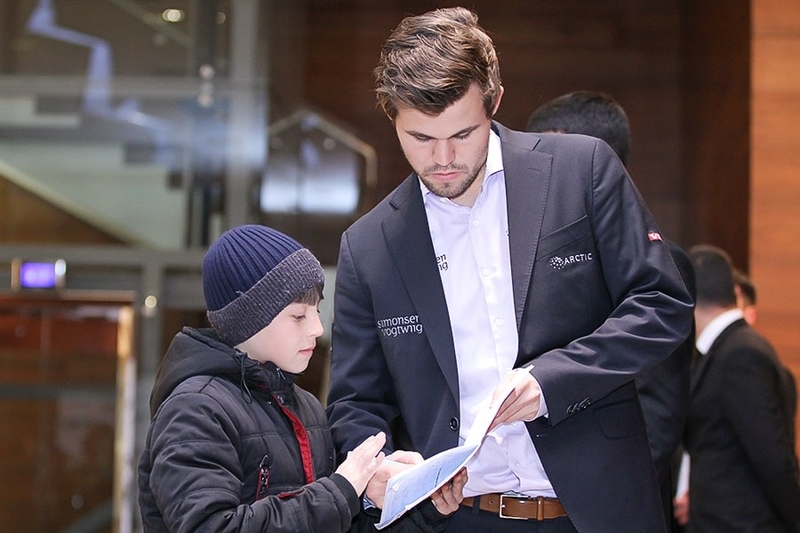 When you’re concentrating on chess and you don’t have time for anything else for some players it can be good – and I hope for me it will be good! 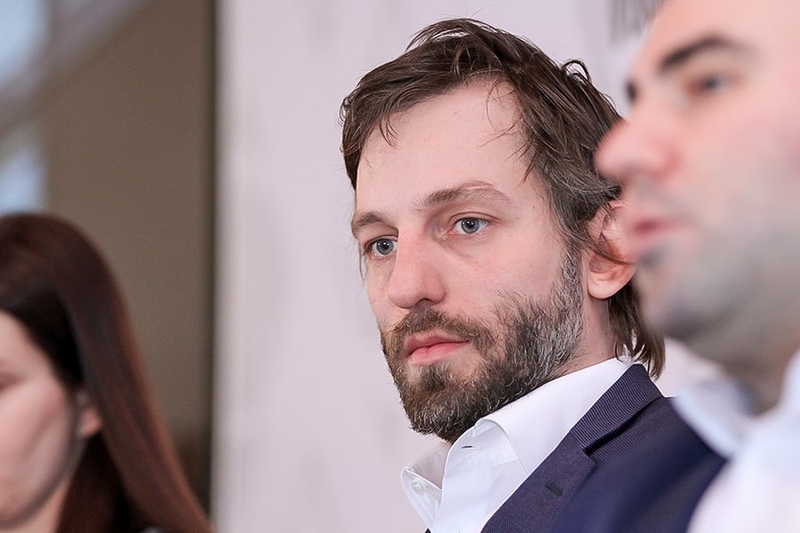 If that game didn’t get the pulses racing Grischuk-Mamedyarov was positively comatose. On move 17 of a 5.Re1 Berlin, in a position where all 20 games in our database had been draw, Grischuk made a new move that was if anything more drawish than usual. 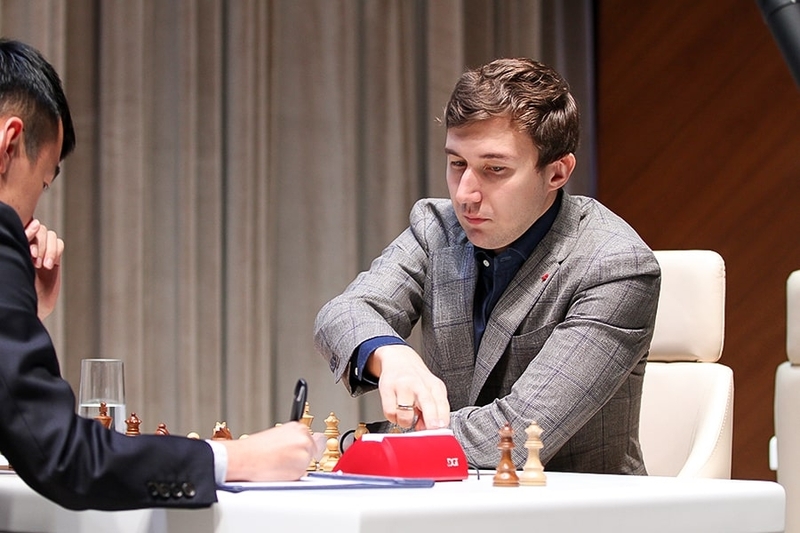 It was Game 12 of the Carlsen-Karjakin match in New York all over again, minus the excitement of the situation, and ended in a quick repetition on move 37. 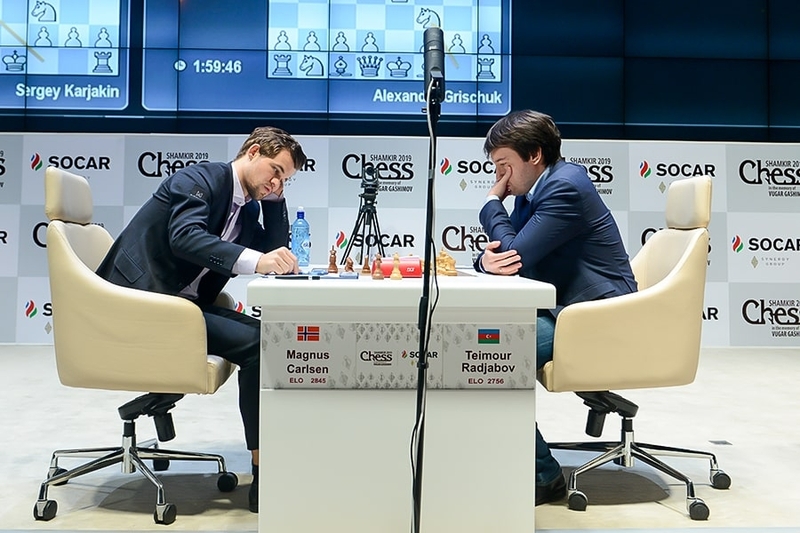 It should be noted Alexander is probably not entirely serious when it comes to relaxing at chess tournaments (just think of his time-trouble agonising over decisions), though anyone who watched his broadcasts during the Carlsen-Caruana match will know he has a few distractions at home! Teimour felt his opponent was “overpushing”, with Magnus agreeing, “clearly d5 was just too ambitious”. He made a rare admission to having “completely misjudged” the ensuing position, with Black left with surprisingly weak hanging pawns in the middle of the board after 16.Nxf6! Qxf6. The game was highly double-edged and could also have swung in Black’s favour, but Radjabov found what he called the “very strong” 24.Bb3! Taking on d3 is inadvisable, with Black left with crippled pawns and a weak d-file after, for instance, 25.Rad1 Bc4 26.Bxc4 dxc4 27.Qg4, while after 24…Qd7 25.Qg3! in the game Magnus decided the time had come for drastic actions with 25…d4!? Perhaps this was the moment when Radjabov’s chances slipped away, since he went for mass exchanges with 26.Nxe5! ?, and at remarkable speed the game fizzled out into a draw. Instead 26.Bc4! poses serious problems for Black, with 26…e4!? still likely to lead to lively piece play rather than total liquidation. It’s a bit of a weird question to answer after the first round, because after the first round everyone has four Whites and four Blacks! Should we change the tournament format so that everyone has the same number of games with each colour pieces? I don’t think we should make the game more even than it already is! 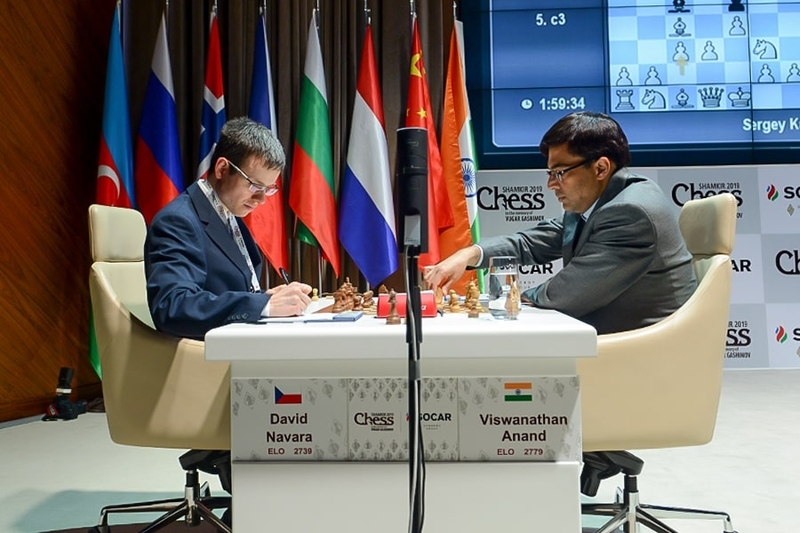 Although that game only threatened to explode, Anand-Navara had decisive result written all over it almost from the start. Czech no. 1 David Navara has himself admitted he doesn’t have the comprehensive opening repertoire of the very best players, and he regretted his choice of the Sicilian Dragon immediately when Vishy went for 7.f3. 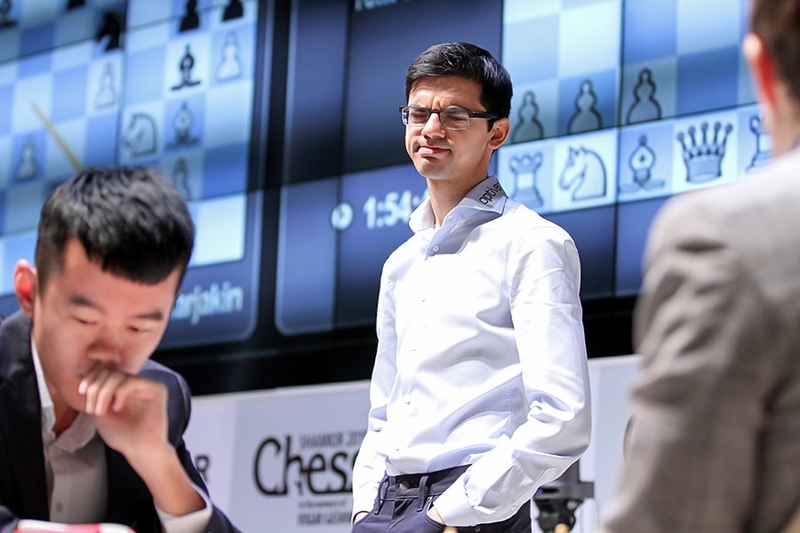 That’s been employed by Anand’s compatriot Karthikeyan Murali, including against Hikaru Nakamura in Gibraltar earlier this year, but David was surprised and fell into a 25-minute think. By around move 15 it was already looking grim for Black, with Vishy admitting he felt he would just comfortably reel in the full point. That impression was boosted by terrible time trouble for Navara, who noted he was no longer used to the time control without increment (until move 61) that’s used in Shamkir. He got down to under a minute for 8 moves, then 12 seconds for 5 moves, when it was becoming a physical struggle simply to make the moves in time. It was a highly tactical position, though, and tricky for both players. A foreshadowing of the drama to follow came when Vishy played 33.Ra4? The more you look at the position, though, the trickier it gets for White. If Vishy was going to escape all the potential checks he would have to walk, as he noted, a “tightrope”. Instead, though, he stumbled immediately (or at least after 10 minutes of calming down and refocusing), with 35.Qe7? The 5-time World Champion had fallen for the same trick again – this time with 41…Rd1+!! The only move not to lose a piece is 42.Nxd1, but then after 42…Qd4+ Black has what GM Jonathan Tisdall called “a neat Christmas tree perpetual”. Black simply gives check from a1 or g1, depending which way the king runs, then returns to d4. Vishy conceded the draw immediately and soldiered through the post-game press conference. That wasn’t quite the end of the day’s action! White’s only move not to lose was 46.Nxf6!, and after 46…Qh2+ 47.Kf1 Qh1+ 48.Qg1 Qh4 49.Qd4 the players took a draw by repetition. So in the end no-one has raced out of the blocks, but Carlsen-Anand is already a classic encounter in Round 2. There was no English commentary on Day 1 in Shamkir, with regular Shamkir commentator Ljubomir Ljubojević reported to have had trouble with his passport in Turkey on the way to the event, but Arkadij Naiditsch is expected to be commentating in English on Monday.